2019 Boxed Calendars are here! These calendars make great gifts for the holiday season! They’re perfect for your kid’s teachers, party hosts, family and friends. They’re available for sale on our site here. The holidays are almost here! Temperatures are dropping in Brooklyn, and we're bundling up while working away on orders in the shop. We have some new festive greeting cards this year, available in our online shop, including the newest "Peace on Earth" card. It feels especially important to send messages of love to our family and friends this year. Place your order for any last holiday gifts, or greeting cards soon for delivery before Christmas! We also always have gift certificates for bespoke letterpress stationery available for a truly thoughtful gift. Last Minute Father's Day Gift! If you're struggling to find a gift for the dad who has it all, we have you covered! Show your father your appreciation for those driving lessons, pre-interview pep talks and so much more with some custom note cards. We have gift certificates available, so he can pick out his own cards later and you get the credit for giving a gift on time! Letterpress stationery doesn't have to be serious, either! Take a look at these cool dad-friendly cards, with a salmon printed in rich black ink. There's still plenty of time to send out holiday cards to friends and family. Its one of our favorite traditions of the holiday season. We have several letterpress designs, with a variety of greetings in our online shop. Each set includes 8 hand printed cards with matching envelopes. We love this Peace on Earth design because it features our dear city in the midst of a peaceful snowfall. Our newest letterpress holiday card is available in our online shop now. We love this bright red cardinal, perched on a branch dotted with holly berries. The stark white paper gives the appearance of a snowy day for this beautiful bird. These cards come in sets of 8 with matching white envelopes. 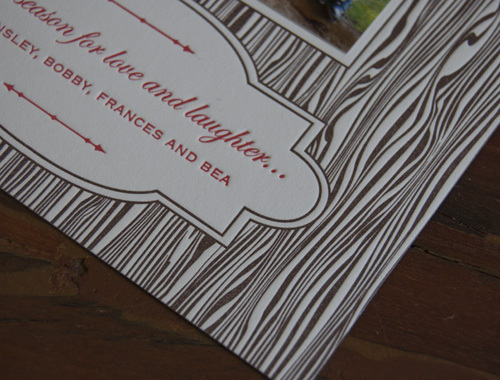 We have lots of other letterpress designs available for your annual holiday mailing. We can't believe it, but its almost that time of year again! We're gearing up for the holidays already and are ready to print your custom letterpress cards for Christmas and the New Year. We have a beautiful line of folded cards that you can customize with a personal greeting. Email us at info@sesameletterpress.com to see the full line and place your order. Our letterpress boxed calendars for 2017 are here! Somehow 2016 has flown by and we're gearing up for the holidays. These little calendars make great gifts for friends, family, teachers - you name it. Each one comes with a t-pin for easy hanging and a resolutions page to keep you on track for the new year. Spring cleaning is made a whole lot prettier with our pink April page. Each calendar page is letterpress printed by hand in bold colors to brighten up your space. Pick one up now from our online shop! Mother's Day is coming up this Sunday, so don't forget to show your mother some much deserved love! If you want to surprise her with something really thoughtful, a set of custom stationery is always a wonderful gift. We have gift certificates available, so she can pick out a design that suits her perfectly. Flowers are always perfect gift, and so are our floral coasters. You can find a variety of these, as well as letterpress printed cards Mother's Day cards in our online shop. We can gift wrap anything and ship directly to your mom. Happy St. Patrick's Day! While we love sending and receiving Christmas cards, it's always fun to randomly get a card for another holiday. This St. Patrick's Day postcard is destined for some mailboxes this March, which will be a fun surprise. It is letterpress printed in cheerful, kelly green with a gaelic phrase on the front. Valentine's Day is upon almost upon us once again! We love sending and receiving mail, and what's better than a handwritten love note? If you're looking for a letterpress printed card to send a little extra love to your Valentine, check out our online shop. A lot of the stationery that we print is for big life events like weddings, bridal and baby showers and birth announcements. These events are always full of love, so we get to print a variety of hearts in our work. All of these hearts on paper are the perfect reminder of the love we have for our family and friends. This year we added a second letterpress calendar to our collection. Inspired by a set of custom botanical coasters that we printed, this single sheet wall calendar features beautiful, vintage floral etchings. We kept it simple with rich, black ink on off-white butcher paper from French Paper Co. for an antique inspired design. We added a single line of gold foil type because we just couldn't resist a bit of shimmer this time of year. Both calendars are available on our website shop. If you're looking for a sweet, last minute gift, we can wrap and send them directly to your loved ones. We've been busy printing holiday cards these days and we figured we'd give you a peek into the process while we print our Ship Holiday card, which is one of our favorites. In case you couldn't tell, we're crazy about nautical themed goods! From whale gift tags to anchor note card sets, we've got it all. Our beloved Golding Jobber press came from a New England seaside town, so it seems fitting that it should be used for these projects. We print the red portion of the card first (the boat and red lights), followed by the navy (you can see the plate for the navy in the photo above) and finally the green string of lights. Lining the layers of a card as precise as this one takes a keen eye and a bit of patience. We hate to waste paper so we constantly reuse scraps for set up and registration while we perfect the prints. Sometimes the most interesting things happen by accident. The combination of the soft blue filigree and the navy ship on this piece of makeready really caught our eye. We have lots of different letterpress holiday card sets available on our site, as well as some great nautical themed gifts for everyone on your list. It's hard to believe but the holidays are just around the corner! It seems like just yesterday we were brainstorming the perfect Halloween costume (do we go pop culture phenomenon or classically creepy this year?). But before we know it, the dishes from Thanksgiving feasts will be piling up in the sink. One of our favorite traditions of the holiday season is the exchange of cards and letters. The process of creating a custom holiday card involves equal parts work and fun. It may all begin on the computer but always ends up in the hands of our printers who expertly cut the paper to size, mix beautiful ink colors and print each layer. Don't you love this card's classic color scheme and imagery? You can almost smell the pine needles in the air. This design is part of our 2014 custom holiday collection, available now. Email info@sesameletterpress.com for a quote. Holiday season is upon us again...and we love it. No complaints here. We're busy printing bespoke social stationery for people to give as gifts and custom holiday cards for our lovely customers. All of this preparation got us thinking about the joy of gift-giving and we wanted to share a few of our products that are perfect for taking a present to the next level! We are definitely from the camp that prefers giving gifts to receiving them and we think that part of the joy our recipients derive is from the care and attention that goes into packaging their gifts up. The designs above are from our 2013 holiday range and double up as tree ornaments: what a multi-tasking product! You really can make the wrapping of a present just as meaningful and thoughtful as the gift itself! Around this time of year, we are always busy printing custom holiday cards for our clients. We really enjoy getting into the spirit of the holidays, even though we still haven't even celebrated Thanksgiving! Last year we printed a really cute photo card which was designed to look like wood grain. Also known as faux bois, this technique was perfect for letterpress. We love how this card came out and think it perfectly captures the wintery theme. Just before the holidays we were commissioned by the creative agency, Hugo and Marie, to print a range of coasters for their clients. We love working with this company because the designs are always a little quirky, surprising and naughty! We heard from one of the staff members at Hugo and Marie that a few clients were requesting additional coasters: it's so great when we hear that a product we printed was a big success! We have put together a lovely range of customizable holiday cards. They are designed so that clients can choose their own photograph to incorporate into the card. All of us here in the studio adore this gorgeous faux bois design. Perfect for Christmas and especially perfect for letterpress: the impression makes the paper actually feel like woodgrain! We designed another small set of plates for West Elm for the 2011 holiday season. We think they would be especially great gifts if given with a stack of homemade cookies!